A multi-national team of researchers found the first known case of manmade pollution in a cave in Israel. The evidence was found in the hardened dental plaque of 400,000-year-old teeth, which had locked-in respiratory irritants, including traces of charcoal— a manmade environmental pollution. More recently in 2017, the analysis of a large collection of hundreds of flint stones and flakes was made at the site, leading archaeologists to conclude that this cave was used as a early form of learning center – a ‘school of rock’ as it was described. Phys.org reports that researchers from Tel Aviv University, in collaboration with scholars from Spain, the UK, and Australia, found the fossilized teeth at Qesem Cave near Tel Aviv, a Lower Paleolithic archaeological site that was occupied by early humans and has already yielded thousands of fossils and artifacts including blades, knives, flakes, hammer stones, hand-axes, and bones from 4,740 animals, such as deer, aurochs, horses, pigs, goats, tortoises and rhinoceroses. The Qesem Cave has also yielded one of the earliest examples of regular fire use by early humans, as evidenced by large quantities of burnt bone, heated soil lumps, ash deposits, and most significantly, a 300,000-year-old hearth in the center of the cave. An analysis of the hearth revealed that it has been used repeatedly over time. Although scientists estimate that ancient humans began using fire over a million years ago, it had been unclear when humans starting using it on a regular basis, for example, for cooking daily meals. Discoveries in Qesem Cave confirmed that they were doing this at least as early as 300,000 years ago. The latest finding of fossilized teeth now reveals that these early humans suffered from a poor quality of air as a result of their regular use of fire, probably without adequate ventilation in the cave. The new study, published in Quaternary International, analyzed the dental calculus of the fossilized teeth. 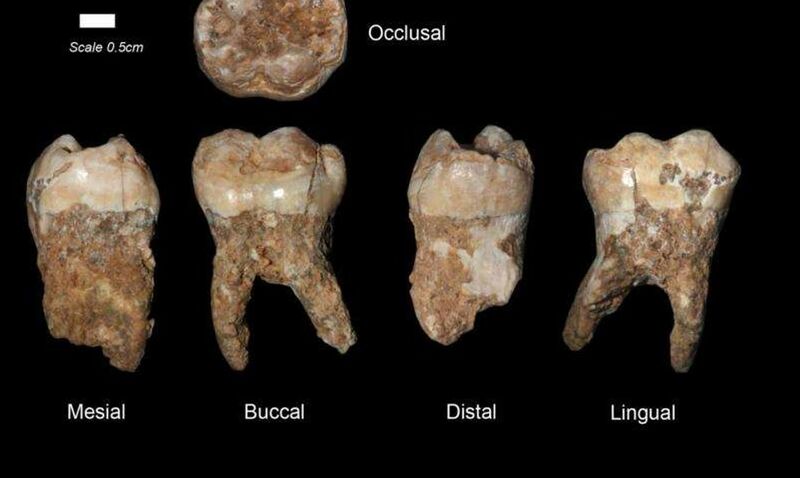 The hardened dental plaque, which the researchers say served as a “time capsule”, was remarkably well-preserved as a result of the cave being sealed for 200,000 years. Trapped within the calculus, the scientists found traces of charcoal from indoor fires. "This is one of the first, if not the first, cases of manmade pollution on the planet… Progress has a price—and we find possibly the first evidence of this at Qesem Cave 400,000 years ago," he added. This inhaled environmental pollution may well have had a negative effect on the health of these early humans. By analyzing hundreds of flint items and specifically looking at the process of ‘knapping’ (the striking technique used to create lithic tools) archaeologist Ella Assaf noticed that the stones had been worked by prehistoric makers with differing levels of competence. Some showed skilled clean breaks, while others showed the scars of breaks and mistakes. Assaf asserted that there was some kind of learning process taking place, which would mean the hominins present at the cave left evidence (albeit inconclusive) of complex behaviors that were not known to exist at the time. “I wouldn’t talk about a school in the modern sense, but we can see a specific tradition, a specific way of doing things in the cave, which was passed on from generation to generation,” says Assaf as reported in a Haaretz article . By the time hominins lived in Qesem they had developed elaborate tool-making and hunting techniques and it seems they had learned to control fire. It is possible that a primitive form of language also developed in order to pass on these skills. Now I might well be wrong, but don’t scientist tell us that we didn’t leave Africa until 200,000 years ago. The article states these are early humans, “Modern” humans left Africa more recently. I think I remember reading that these early humans died out before more modern humans left Africa. Well at least the academics are considering that there are stages of development between hunting and gathering to an organised civilisation. Their somewhat binary view of the world has been polarised and naïve or it often ignores the enabling steps inbetween to bring civilisation about. They may wish to established facts, but the far past is not so black and white, the more it is debated, the more we can understand of what the issues actually were, but not discussing them at all just keeps us all in the dark.